The semiconductor equipment giant makes a big move with impact in the solar manufacturing world. 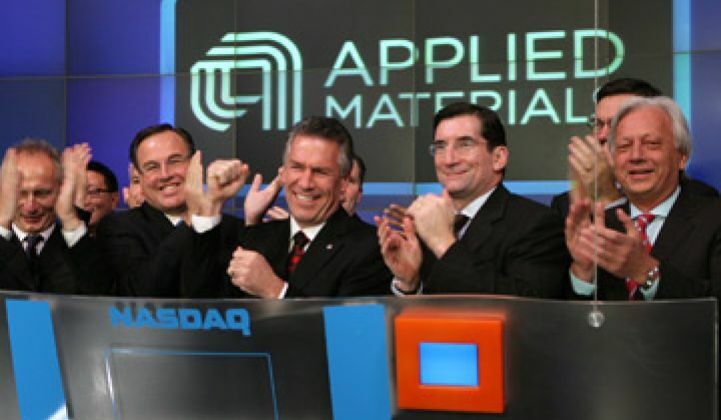 Applied Materials (Nasdaq: AMAT) is making a big move -- the semiconductor equipment giant is acquiring Varian Semiconductor Equipment Associates (Nasdaq: VSEA) for $4.9 billion. The price is a 55 percent premium to yesterday's closing price. Varian is the leading supplier of ion implantation equipment used by chip makers and has recently been applying this technology to crystalline silicon wafers for photovoltaic panels. Varian will operate as a business unit of Applied's Silicon Systems Group and will continue to be based in Gloucester, Mass. Varian's main business is semiconductor manufacturing but the company has recently made a foray into solar wafer manufacturing with the promise of raising efficiency and bringing a Moore's Law model to the solar industry. Varian believes it can bring a Moore's Law-like momentum to solar with its ion-implantation equipment, long used in the semiconductor industry. We've covered Varian's ion implantation and its application to solar before. Varian supplies ion implantation equipment to most of the major semiconductor manufacturers in the United States, Europe and Asia. Revenue in the firm's most recent quarter was $227.7 million. Suniva is the first PV manufacturer to successfully leverage ion implantation in the mass production of solar cells. By using this technology, Suniva claims the ability to compete with high-efficiency PV manufacturers such as Sunpower (Nasdaq: SPWRA), as well as with low-cost, lower-efficiency Asian manufacturers. The firm looks to balance the trade-off between cost and efficiency. According to Jim Mullin, the Vice President and General Manager of Varian's solar group, 90 percent of crystalline silicon cells are the same product made on the same equipment. Varian is looking at a way to fundamentally change the c-Si cell itself. Mullin suggests that the silicon solar cell "is essentiality just a diode" with a semiconductor junction -- and the quality of that junction determines the quality of the cell. Varian has partnered with more than seven Chinese PV manufacturers to insert patterned ion implantation into volume manufacturing by mid-year. Just as with Suniva, Varian's process will let China's PV module manufacturers reach increased cell efficiency at lower production cost by replacing diffusion doping processes with ion implantation. The new approach eliminates multiple production steps, improves cell uniformity, and can allow tighter module binning. Suniva has reached 19 percent cell efficiencies with a roadmap to 22 percent using ion implantation, as well as other tricks. Varian claims that patterned implantation provides a roadmap to efficiencies of 22 percent at reduced costs per watt. SunPower, the solar PV efficiency leader, makes production solar cells in the 23 percent range, reaching 24 percent in the lab. “The strong market interest in [ion implantation] from so many Chinese PV manufacturers further validates the value of implant for manufacturing high-efficiency, low-cost solar cells,” said Varian’s CEO Gary Dickerson. According to Mullin, solar cell production is not complex -- it's basically a six-step process. The current diffusion process is a "blanket process" and the dopant for p-type cells, phosphorous, diffuses into both sides of the cell, although it's only needed on one side. The solar industry either has to mask one side or remove the dopant on the other side. Contrast this to the one-sided implant process. Diffusion is also a high-temperature process which creates a glass layer that has to be removed after the process is complete. Implantation is not a high-temperature process, so there's no need to remove glass. Today, Varian can do blanket emitters with implanted phosphorous as well as patterned phosphorous emitters. Future roadmap products include boron implantation and patterned boron with potential cell efficiencies approaching 23 percent. The selective emitter design uses a lightly doped emitter without trading off in terms of contact resistance. Implantation is done through a mask to create a heavily doped region below the "fingers" to enable selective emitter structures. Varian has shipped thousands of semiconductor tools that are currently in the field running 365 days per year. The team I spoke with prided itself on understanding ramp-up and scaling production. The company envisions 18-month, semiconductor-type process improvement cycles finally reaching solar and bringing at least a hint of Moore's Law to the PV industry. The adoption of ion implant technology by China's solar manufacturers sends a message to the industry's PV efficiency leaders like SunPower that they can't rest on their laurels. This deal further solidifies Applied Materials position as an equipment supplier to both the semiconductor and solar industries. China's solar manufacturers will continue to be significant customers for Applied. AMAT's stock price was down 0.39 percent to $15.18.